Staff Photos by Jason Orfao Hollis Brookline sophomore Mike Moscatelli reacts after the Cavaliers wrap up the first set on Friday during a 3-0 victory at Souhegan. AMHERST – It was next man up for Hollis Brookline on Friday, and the Cavaliers’ depth delivered a victory. Nick Wood racked up 13 kills and seven aces, pacing the defending champion Cavaliers to a 25-17, 25-17, 25-16 sweep of the Sabers at Souhegan. Hollis Brookline (3-2) is dealing with absences due to spring vacation, but the likes of Kieran Mulligan, Josh Ide and Aidan Chretien filled the void admirably. Mulligan finished with a team-high seven digs and Marshall Coutu added three kills. Mitchell Cochran had two aces, while Hayden Kubishta tallied 14 assists and two aces while manning an unfamiliar position. Matt Greany sparked the Sabers with a stellar defensive effort at libero, while Jackson Gordon orchestrated the offense at setter and ended with a team-high nine service points. 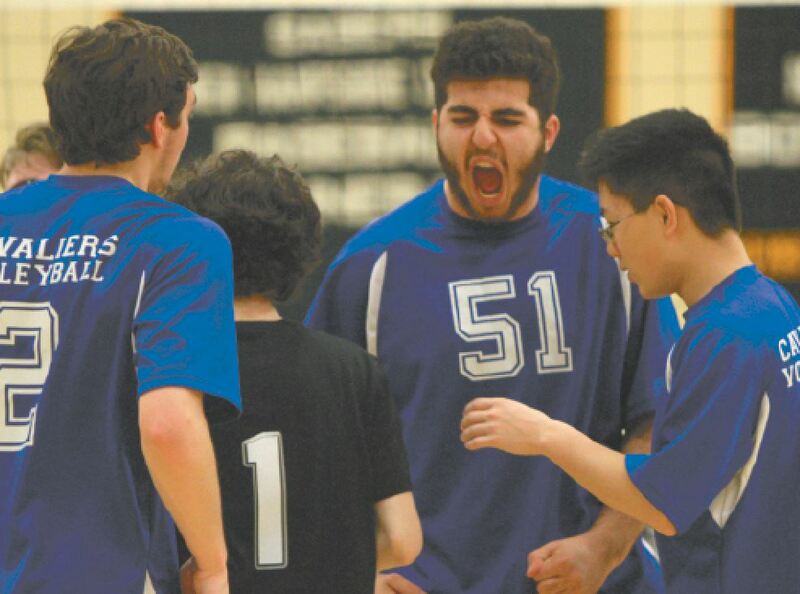 Khaled Nazeer and Brian Wilson led Souhegan (0-5) in hitting with three kills apiece. The Sabers are inexperienced, but are looking to stay positive and keep improving. “We’ve had a rough season,” Souhegan coach Cassie Kurtz said. “The good thing is that they continuously improve as a team each game they play. The downside is that the division is really stacked this year. We have a whole new team, so it’s really tough. Hollis Brookline hopes to position itself for a title defense come June. Leonard says having a player like Wood makes that job easier.